Microsoft Azure platform has introduced many resourceful cloud computing services which can be acquired with paid azure subscription plans in order to fulfill our target cloud infrastructure requirements. Whether we want to set virtual machines, mail servers, storage servers, perform artificial intelligent computing or machine learning servers and workspace, Microsoft Azure is a complete tool. Implementing machine learning algorithms are very difficult task. In other words, machine learning solutions in general will take almost 90% of our efforts & focus to improve our solution's accuracy, while reaming 10% of our efforts & focus may or may not work towards application implementation of our solution. So, Machine learning domain is both resource & time consuming yet very satisfying, since, both machine learning and artificial intelligence are the only domains that are capable of solving problems beyond our imagination. Microsoft introduces Microsoft Azure platform and take away most of the development & implementation tensions of machine learning & artificial intelligence domains leaving researchers, developers and enterprises to focus on the main goal rather than be exhaustive over the how's of implementation processes of the machine learning base solutions in order to achieve our revolutionary outcomes. 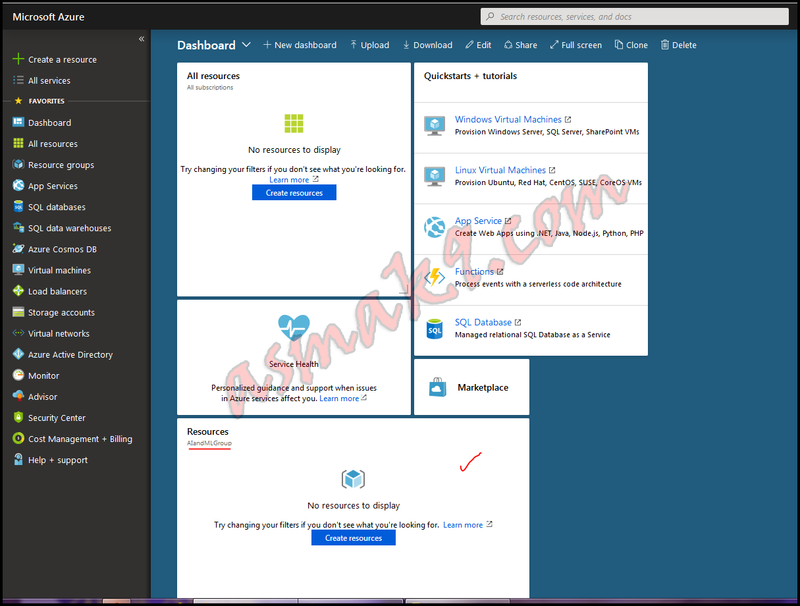 In today's article I shall demonstrate installation of premium Microsoft Azure Machine Learning Studio workspace into our Microsoft Azure paid subscription account. 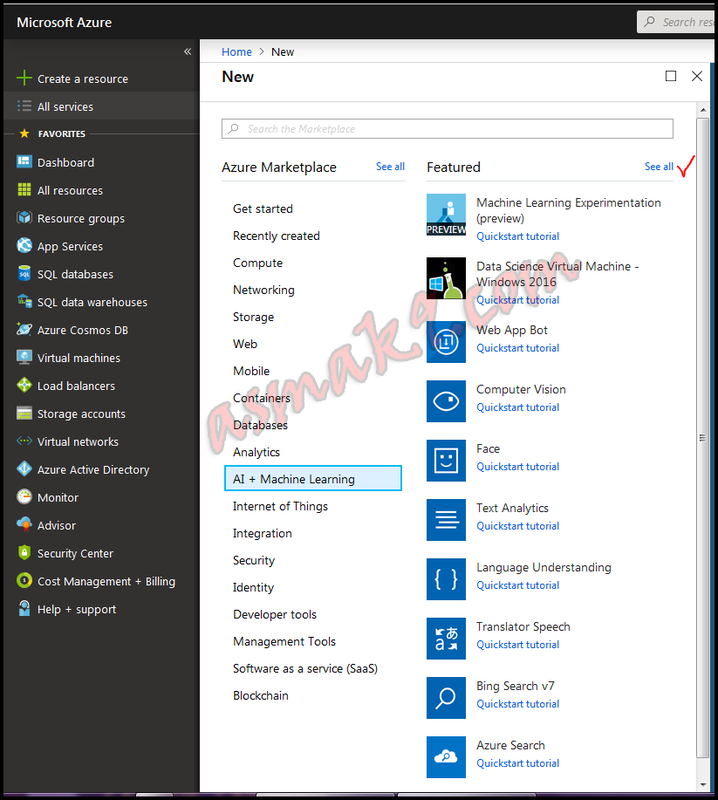 Microsoft also offers free Microsoft Azure Machine Learning Studio seat (workspace) as well, which do not require any Microsoft azure account with paid subscription. You can sign that up if you do not have Microsoft azure account to experiment with machine learning. 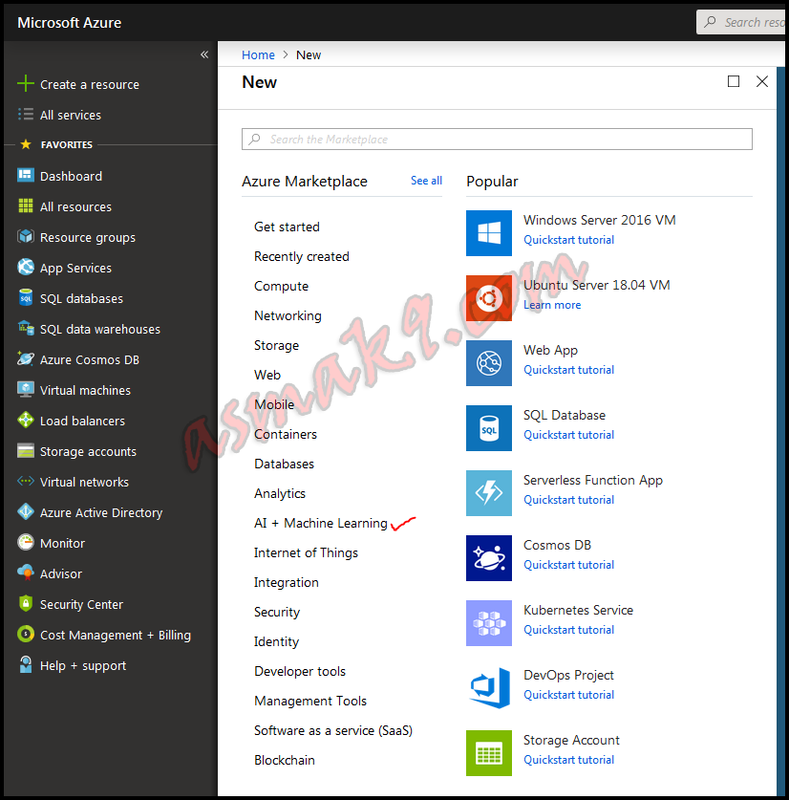 But, in this article, my focus is on setting up of paid Microsoft Azure Machine Learning Studio seat (workspace). You can learn more about the pricing of Microsoft Azure Machine learning Studio seat (workspace) free/paid as well. 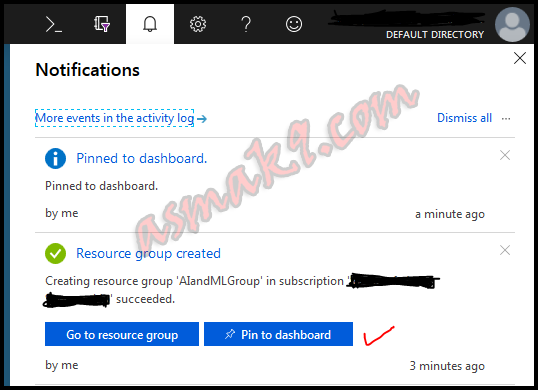 Microsoft Azure Account with Paid Subscription. 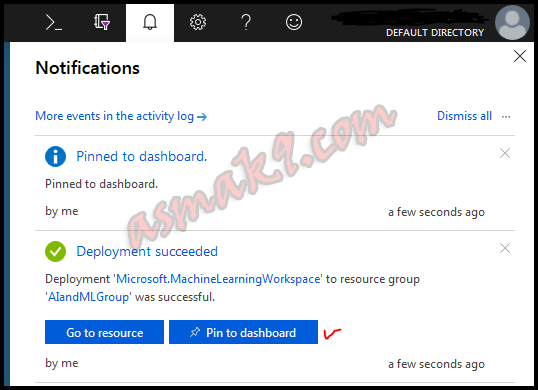 1) Create Microsoft Azure paid subscription account. 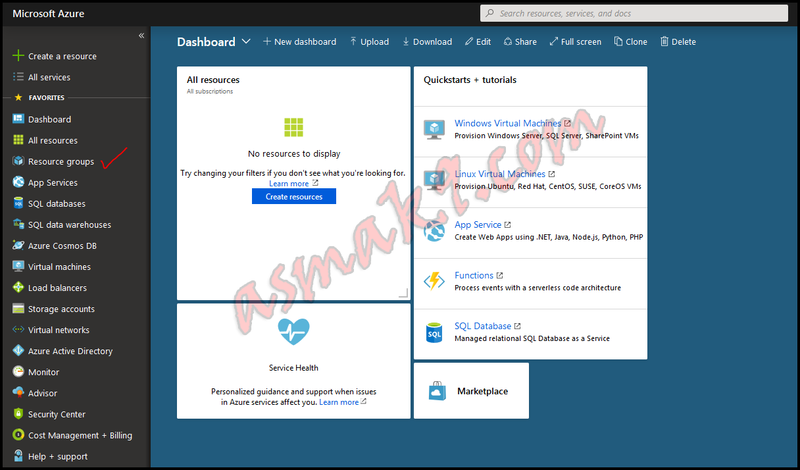 2) Login to Microsoft azure portal and you will be able to see your dashboard. 3) Before you acquire any cloud service offer by Microsoft azure paid/free. You need to create a logical container called "Resource Groups". So, you can categorize your acquire cloud services and can easily manage and monitor same type of services that you have acquired. 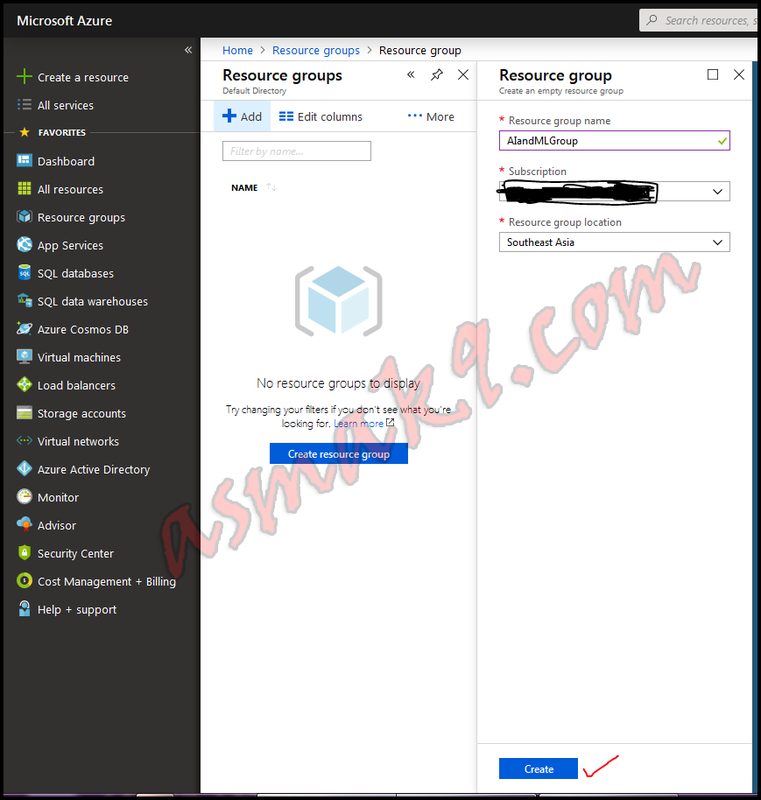 This is how azure is designed, you have to create a resource group before acquiring any service. So, click on the "Resource Groups" on the right menu as shown below i.e. 4) Now, click on the "Add" button as shown below i.e. 5) Type your resource group name that best describes your cloud services category. In this case, since I am creating Microsoft Azure Machine Learning Studio seat (workspace), therefore, I name my resource group "AIandMLGroup". I will add any cloud service that I may acquire in future related to AI & ML into this category for my convenience. 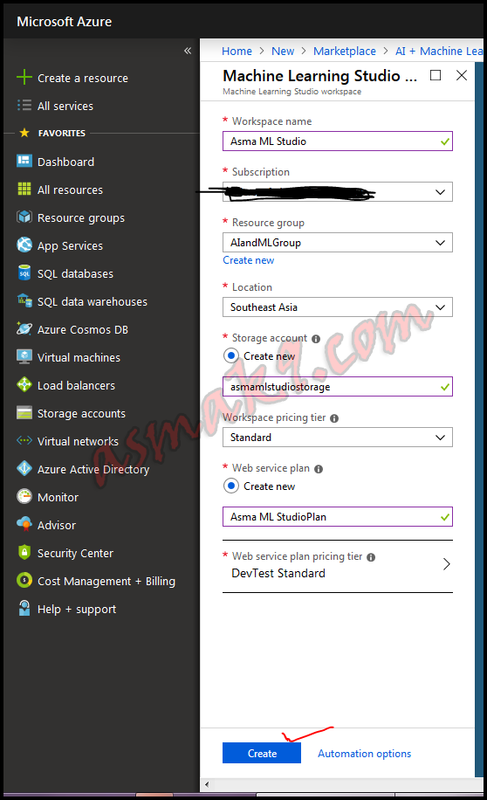 You need to select your subscription and also your physical storage server location base on Azure Latency Test as this will affect your cloud service performance. Smaller the latency time better the performance, so, choose accordingly. Then click create as shown below i.e. 6) Pin your resource group to your dashboard if you like from the notification pane as shown below i.e. 7) No let's create our premium Microsoft Azure Machine Learning Studio seat (workspace). Click "Create Resource" from the right menu as shown below i.e. 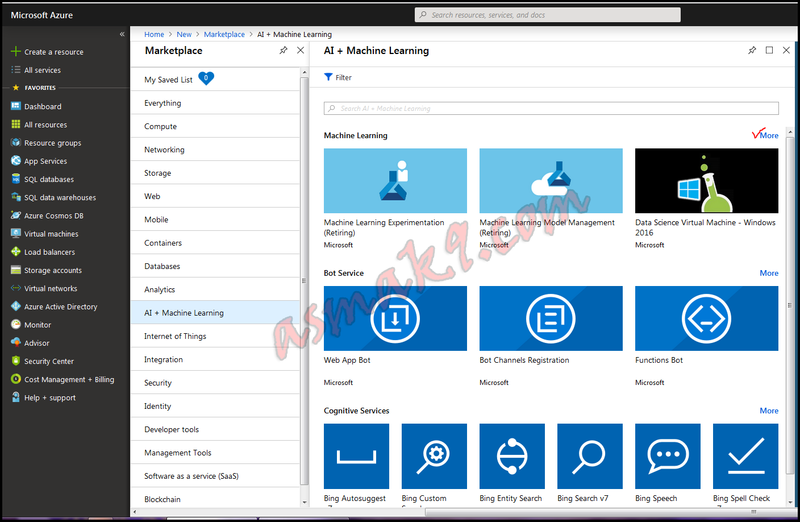 8) Then click "AI + Machine Learning" category from the Azure Marketplace as shown below i.e. 9) Click "See all" at the right side of featured category as shown below i.e. 10) Click "More" at the right side of "Machine Learning" category as shown below i.e. 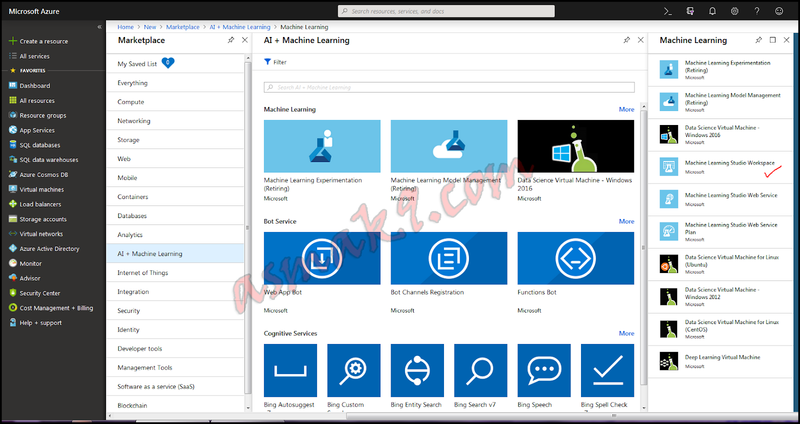 11) Click on "Machine Learning Studio workspace" as shown below i.e. 12) Now, click "Create" as shown below i.e. 13) Next, name your machine learning studio, I name it "Asma ML Studio" then choose your subscription, next, choose your resource group as I have chosen "AIandMLGroup" that I have created earlier for my this cloud service, then choose your physical storage server location base on Azure Latency Test as this will affect your cloud service performance. Smaller the latency time better the performance, so, choose accordingly. Next, either create new or choose existing storage account you want to associate with this machine learning studio. 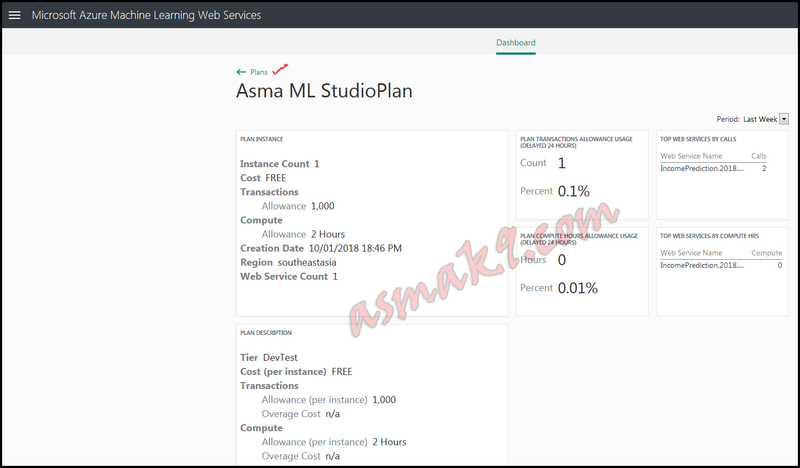 Finally, choose your machine learning studio web service costing plan carefully, I have selected "DEVTEST Standard" pricing plan, then click "Select" and then click "Create" as shown below i.e.. While selecting your machine learning studio web service costing plan. 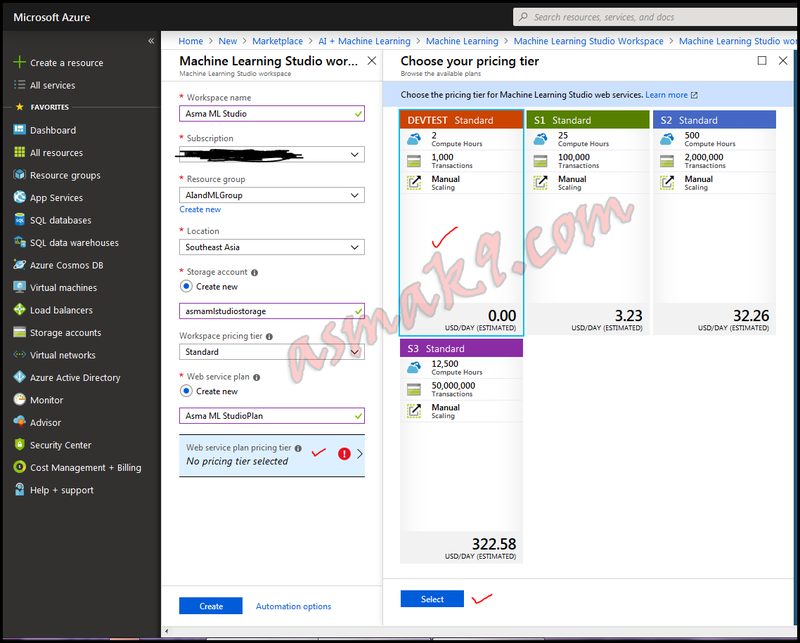 You need to understand few things in Microsoft Machine Learning Studio Price Plan first. As per Microsoft Machine Learning Studio Price Plan your charges will be deducted on monthly base although above snippet shows USD per day, but, that's a convenience estimated break down which shows that how much per day you will be charged for your web service whether you use the web service feature or not. The transactions quota per plan are the total Web API calls you can make from your web service per month and the compute hours per plan quota are the number of hours your each web API call take to execute per month e.g. if your Web API single call takes few milliseconds to execute then that few milliseconds will add up each time you call the Web API and reach up to your compute hours quota, if you have used all of your plan compute hours in a single day then additional cost on per compute hour base will be charged from you whether your web API call takes an hour or few milliseconds to execute you will be charged extra base on per compute hour. 14) Wait a few moments while your machine learning studio workspace cloud service is being deployed, pin your studio to the dashboard if you want as show below i.e. 15) Now, click your machine learning studio that you have just created and have pinned to the dashboard, then click "Launch Machine Learning Studio", then click sign in/my experiment as shown below i.e. Your Premium Microsoft Azure Machine Learning Studio is deployed successfully, so, enjoy your machine learning experimentation and then deploy it as web service to utilize your machine learning solution. 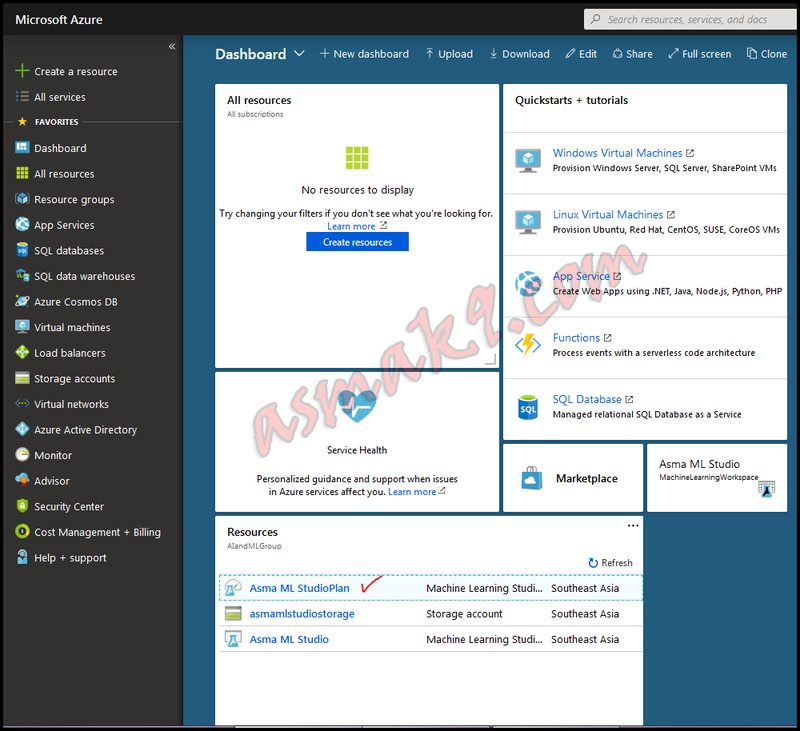 In the below screen, notice that your web URL will now be "https://asiasoutheast.studio.azureml.net/". 16) Let's talk a bit about the monitoring of your machine learning studio web service quota consumption according to your cost plan. 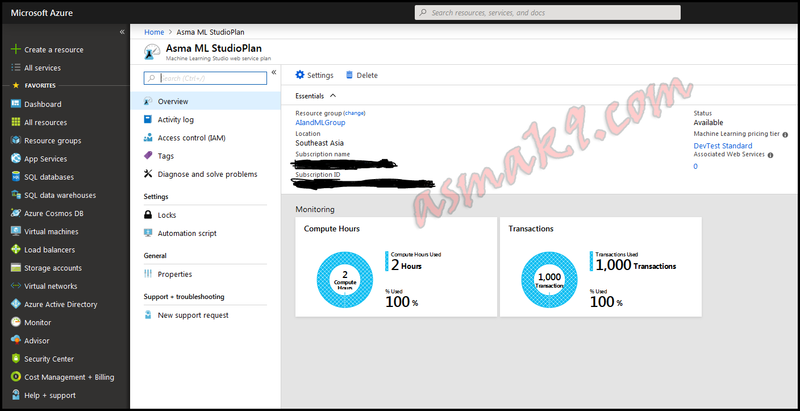 Go to your azure portal dashboard and then click "Asma ML StudioPlan" which I have just created as shown below i.e. 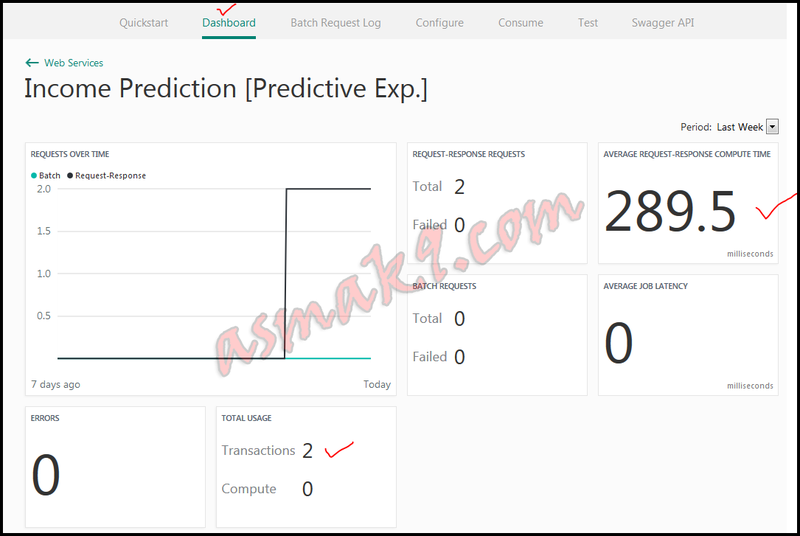 17) You will see a screen that will show you monitoring graphs for your web API transactions and compute hours quota as shown below i.e. The above screen graphs take a day or more to get updated each time you utilize your plan quota. So, do not get scare or confuse that why is it showing 100 % utilization or why is it not showing update utilization of my quota, while I have just only deployed my machine learning studio and have not done any quota utilization, the above graph shows you accumulated quota utilization of your all web services from your available cost plan quota. In my case, when I have checked the next day, the above graph is updated as shown below and by that time I have created a sample web API of my sample machine learning model and make two web API calls via Rested browser client i.e. Since, the above graph is showing the accumulated quota utilization of your all web services from your available cost plan quota, so, we do not know how much quota our single web service is consuming. So, to monitor the quota consumption for single web service of your cost plan. Click the number below "Associated Web services" as shown above. Since, I have already created a web service, so, the count is increased accordingly. You will be taken to the "Microsoft Machine Learning Web Services" page. Sign In if not already signed in i.e. Now, below screen will show you your available plan allowance and your each created web service web API calls count with some other accumulated quota monitoring measuring matrices. So, click "Plans" as shown below i.e. Now, click "Web Services" as shown below i.e. Then click on your selected web service whose quota consumption you want to monitor i.e. Finally, click "Dashboard", which will show you your selected web service quota consumption for your cost plan as shown below i.e. In this article, you will learn to setup premium machine learning studio seat (workspace). You will learn to create resource groups. You will learn to deploy your machine learning studio by selecting suitable cost plan and by selecting suitable physical storage sever location base on Azure Latency Test. You will also learn to monitor your premium machine learning studio created web services accumulated quota consumption according to your cost plan quota and you will also learn to monitor your individual created web service quota consumption according to your cost plan quota.